The Pure Grenada Music Festival, has announced its official sponsorship agreement with Westerhall Rums Grenada. 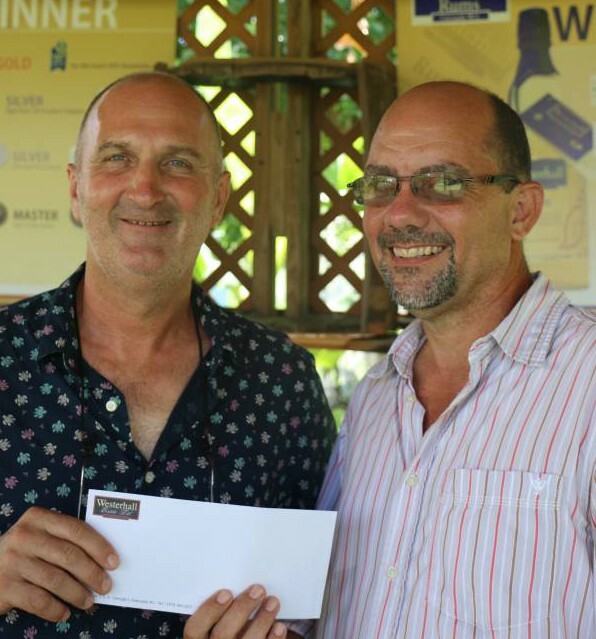 The cheque was presented to Steering Committee member, Mr Dieter Burkhalter, by Managing Director of Westerhall Rums Grenada, Mr Graham Williams. “The partnership is as complementary as it is strategic, based on common beliefs and values of quality and excellence, which allows for collaboration that will add to the thrill of the festival experience”, Mr Williams stated. As the Reggae Night Event Sponsor on Friday, 8 April 2016, Westerhall Rums Grenada will create audience experiences at the Festival aimed at consumer engagement. In addition, as an international award-winning brand, Westerhall Rums Grenada will also leverage the sponsorship with support for the presentation of Grenada and its musical offerings to the world, through both their brand and festival related social channels. This expansion of opportunities to engage fans and artistes seeks to amplify the festival experience at every opportunity and capitalise on the driving force that is music, to bring together people with a passion for the art form. The Pure Grenada Music Festival will, over 6 days, showcase the island of Grenada via 4 distinct locations. The Festival Village and Main Stage will be located on the spacious green at Port Louis; the VIP Stage at the exquisite Calivigny Island; the Floating Stage in the picturesque St George’s Harbour — the Carenage; and the Mobile Stage which will feature free concerts in the towns of Grenville and Gouyave located North East and West of the island respectively. Local artistes will perform alongside, those more internationally renowned to include soul singer Joss Stone (UK); folk band Madison Violet (Canada); reggae superstar Etana (Jamaica); international reggae band Steel Pulse (UK); rising phenomenon, Jesse Royal (Jamaica); world music sensation Angélique Kidjo (Benin); contemporary jazz artist Eddie Bullen (Grenada/Canada); jazz/soul singer and songwriter Zara MacFarlane (UK); steel pan extraordinaire Andy Narrell; and acclaimed musician Hendrix Ackle.